(From left) Samantha Wallace Sharpe ’09 moderated the panel “The Life-Work Balance Unicorn: Seeking Balance and Making Trade-offs,” which featured physician Katie White Arendt ’98, community volunteer and stay-at-home mom Kelli McNairy Winston ’93, and Jonna Gallo Weppler ’93, who recently left a long career in publishing to join an equity fund. 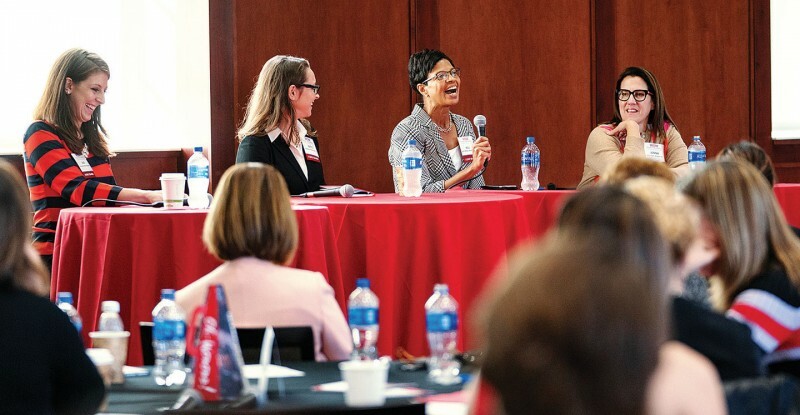 Some of Ohio Wesleyan’s most accomplished alumnae traveled from across the country to participate in the second biennial Women of Ohio Wesleyan (WOW) leadership forum Oct. 19 and 20 on campus. Lisa Luckett P’16/’20 delivered a keynote address based on her new book, The Light in 9/11: Shocked by Kindness, Healed by Love, which traces her inspiring journey through grief, following the death of her husband Teddy Luckett ’84 in the terrorist attacks of Sept. 11, 2001. Samantha Wallace Sharpe ’09 and Kara Trott ’83, a member of the OWU Board of Trustees, served as co-chairs, working closely with volunteer committee members to plan a meaningful event that tackled the value of advocating for oneself, the question of having it all, and challenges specific to women in the workplace. The date for the next WOW has been set for Nov. 6 and 7, 2020.